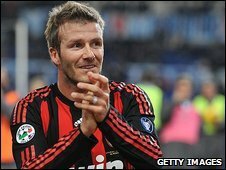 David Beckham has confirmed he wants to secure a permanent move to AC Milan from his American club LA Galaxy. Beckham denied his lawyers were talking to the Galaxy, as Milan general manager Adriano Galliani had claimed, but hopes the two clubs can agree a deal. "I have expressed my desire to stay," he said. "Now it's just down to Milan and Galaxy to come to an agreement. Beckham was speaking in Glasgow on Wednesday after playing the first 45 minutes for Milan in their 2-2 friendly draw with Rangers. The England international, 33, is on loan at the San Siro until 9 March and has helped lift Milan to second place in Serie A, scoring in his last two games. Are we witnessing the rebirth of David Beckham? "I respect the Galaxy and everything they have done for me. They have always been great to me." But Beckham added: "I hope they can come to an agreement and it's down to the clubs now. At this point it's out of my hands. I've said what my feelings are to both clubs. "To be given the chance again to play at this level at my age is pretty incredible and I've enjoyed it so much I would like to continue it. I think people have seen the way I've been since playing at this level again." One of Beckham's key reasons for joining Milan on loan was to prove himself to England manager Fabio Capello and after putting in such impressive performances in Italy so far Beckham now believes the 2010 World Cup in South Africa is a realistic target. "It's nothing against the MLS and the football over there, because it's a game that will grow but it will take quite a few years. "I'm still confident that will happen eventually, but I want to have a chance of being involved in 2010 and I believe my best chance of doing so is to remain here." Galliani had said earlier on Wednesday that Beckham's lawyers were already talking to Galaxy. "If they show themselves to be ready to look at a deal, we would be really happy to do so," Galliani said. Beckham is registered with the Serie A giants until 30 June, so if a deal is agreed with the Major League Soccer side then the loan term can be extended outside the transfer window, which closed on Monday. Milan have taken that into account by including the England player in their Uefa Cup squad. "We are looking to get him either on loan until the end of the season or on a permanent basis," added Galliani. "Otherwise, with the greatest regret from everyone - starting with me - Beckham will have to go. "Players can make their choices but their clubs can refuse their wishes. "Moreover, Los Angeles Galaxy have always been very nice to us and have behaved in a very gentlemanly manner. "In any case, at this moment there are no dealings and we haven't made an offer but Beckham's lawyers are talking with Los Angeles. "There is time until 8 March to get us round a table and close a possible deal." The Galaxy refused to discuss Galliani's claims. Spokesman Patrick Donnelly said on Wednesday: "We have no comment to make." However, the former general manager of LA Galaxy, Alexi Lalas says Backham's England career may be the reason he wants to stay in Italy while also recognising the significance his departure would have on the game in America. "I know how important it is for David to play with the national team," said Lalas. "Obviously he feels that for him and maybe for Fabio Capello, the best route in order to do that is to be at Milan. "He has obviously done great things on the field since he has been there and I think he is happy by all accounts. "For the Galaxy, for Major League Soccer and for soccer in the United States, obviously it is a loss."